Our friend Ryan recently introduced us to pressed pennies for collecting while visiting the National Museum of Natural History in DC. His wife actually collects them but for us we immediately thought it would be perfect for our kids. Honestly it would be perfect for any young kid. Now every museum or destination (example rest stops on a road trip) we bring along 51 cents to press a penny. 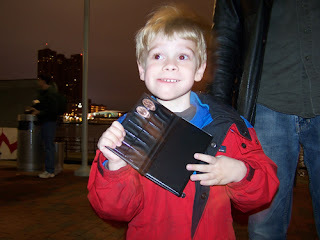 Recently we went to the Baltimore Aquarium and instead of buying an overpriced souvenir in the gift shop both of my kids were thrilled to pick out their picture for their pennies. If you don't have kids yourself set your nephew or niece up with a penny passport and a pressed penny from the state you live in. Then every time you visit him/her bring a pressed penny to add to their collection. You'll immediately be the favorite aunt, and that's what we all want. Right?!? !